Dona Onete, the Queen of Carimbo, will make her debut in the United States next Tuesday (September 27th) at the CUNY Graduate Center. Despite being a lifelong singer and composer from the Amazonian state of Pará, it took a while for Dona Onete to embrace the career in music. 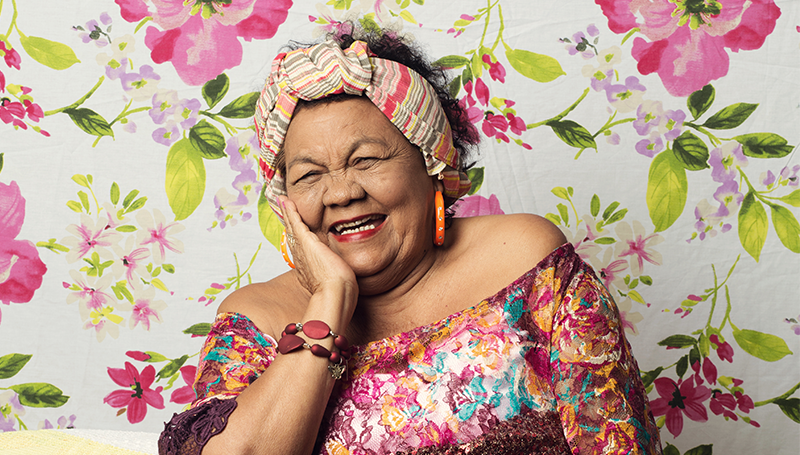 She released her first album, “Feitiço Caboclo”, in 2014, at the age of 73. The second one, “Banzeiro, just came out this Spring. All the while, Dona Onete has performed with her band at festivals all over Brazil, France, Portugal, United Kingdom and lastly at the Olympics in Rio, bringing to the world’s attention her signature genre, which she calls ” carimbó chamegado”. Carimbó is an indigenous rhythm and dance from Pará, influenced by both African and European traditions and Dona Onete created something new by mixing it with ” lundum” and the rhythm from the songs of the slaves. It is slower and more sensual”, explains the artist, who grew up singing for pleasure by the river, her main source of inspiration, and performing occasionally in local bars in her hometown, Igarapé-Miri. Back then, she would never imagine what would lie ahead. Eventually, she became a professor of History and Amazonian studies, doing extensive research on the rhythms, dances and traditions of the black and indigenous people of the area and was later elected Municipal Secretary of Culture. By the time she retired she was already a prolific composer, but she has only started to sing professionally after she met, by accident, the band that would open a new chapter in her ever changing life. About her life, she says: “I have the impression that everything happens at the right time. I am not really one to rush. My life is like a river and the current takes me. If it comes to a port, I stay for a bit, and then I just carry on my way”. Her next stop is New York. Don’t miss it!